The Wobage Makers invite Cardiff graduate Josh Redman, for a couple of years in the pottery. After a busy Summer, technician to the Summer courses, Josh is settling back in to his own production of functional pots and sculpture. In hot pursuit of the rural Herefordshire idyll, he is baking bread as well as gas-fired reduction stoneware. Watch this space for an artist’s profile and some pics of his new work. This Autumn’s sunshine offered perfect opportunity for us to move ahead with the groundwork and kiln-shed construction for the new site. 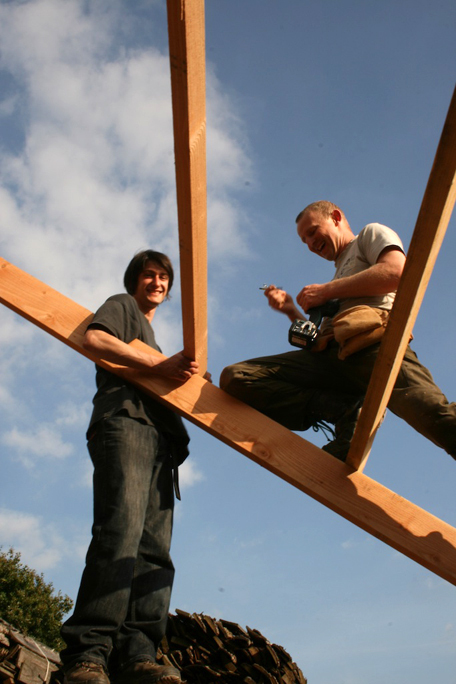 Contrary to the misleading pics, the shed construction was largely undertaken by strong girls with big tools belts, namely Patia and 3rd year Cardiff Degree student Fleen Doran. Thank you Fleen for your hard-work and millimeter perfect measuring! 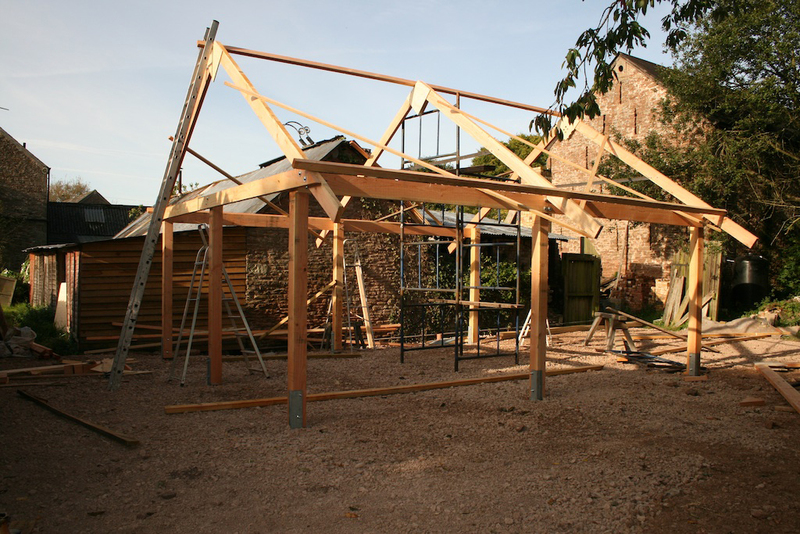 The shed will be completed this Winter and Patia will be building a wood-fired bottle kiln to fire her slip-decorated earthenware. A new larger wood-salt-kiln will also later be constructed on the same site. A couple of good salt-firings in September and October, have included most of the work made during Jeremy’s and Sarah Dunstan’s courses over the Summer of 2009. Many have already been collected. If you’ve not yet been contacted, then there are a handful of pots that are still to be fired and yours are included in these. We’d hoped to have them all through before our own preparations and firings for Christmas exhibitions. Unfortunately however, these pots will now not be fired until December. We’ll be in touch as soon as they are. If you are passing by anyway before then, there will be some pots for you to collect. We are now making final clarifications of dates and content for the programme of courses for next year. 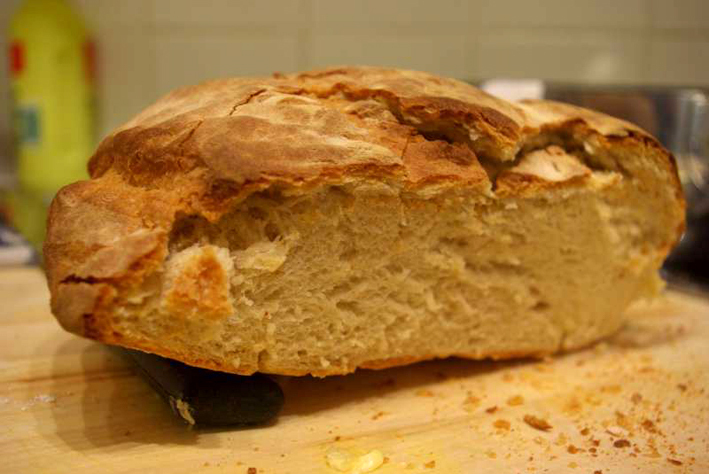 The 3-day beginners course will run in July rather than June. 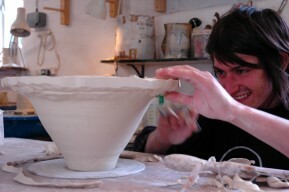 Jeremy’s Jug-making, also in July, will run for four rather than the 3 days this year. We are making some changes to the 7-day handbuilding/throwing and salt-glaze course for 2010. 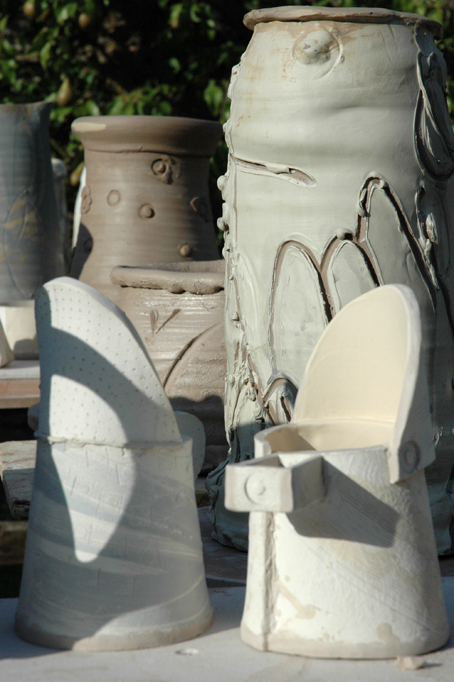 There will instead be a shorter making workshop aimed at more experienced potters with Nigel Lambert running the handbuilding studio. This will run in the first half of August. Jeremy will then run a 5 day firing course in September. Priority of place for this, a maximum of 6 students, will be offered to participants on previous courses during the Summer, enabling them to pack and wood-fire their own pots. 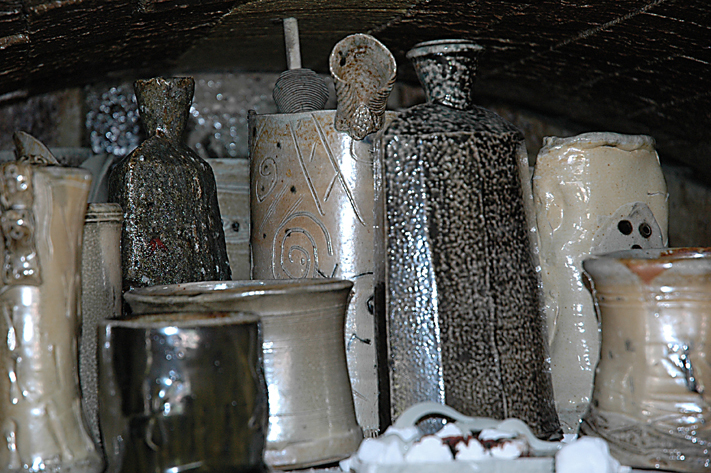 This course will include tutorial in basic slip and glaze chemistry, delving more deeply into specifics of raw-glazing and salt-firing. Many will be pleased to hear that Patia will be tutoring a follow-on to her successful new course of this year, ‘Slip-decorated earthenware’. We anticipate that all details and dates will be live on the site for the end of November. 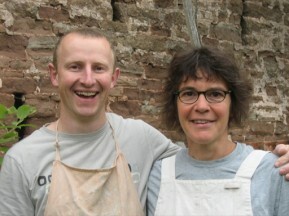 We are delighted to welcome Sheila Herring into the pottery for a one year apprenticeship from September 2009. This follows the successful application submitted by Sheila and Jeremy earlier in the Summer to the ‘Adopt a Potter’ scheme. Now a registered charity, this fantastic project to fund workshop training to students, was initiated by salt-glaze potter Lisa Hammond. We are the first to benefit from an award, with another grant just around the corner. Working alongside Jeremy’s wood-fired salt-glaze production, Sheila will be assisting with general studio chores; clay-making, slip & glaze preparation, kiln packing and firing. Importantly she will at the same time be developing her own range of wheel-thrown work. Sheila’s already making some gorgeous pots, look out on future posts for pics from forthcoming firings this Autumn/Winter.